The Red Deer (Cervus elaphus) is the largest land-mammal in the UK. The summer coat is reddish brown to brown and the winter coat is brown to grey. Stags have large, highly branched antlers and the number of branches increases with age. Antlers can have up to 16 points in wild animals. Red Deer are a native species having migrated to Britain from Europe 11,000 years ago. While preferring woodland and forest habitats in England and southern Scotland, Red Deer can adapt to open moor and hills as they have here on the west coast and are common in the Scottish Highlands. When the days get shorter and temperatures sink, and the autumn paints the bracken on the hills brown, the Red Deer rut starts. The rut is a period when the biggest and strongest male (stag) rounds up a group of females (hinds) for mating. They live separately for much of the year but come together rather vocally in late September or early October at the start of the rut. Hinds are only fertile for a day or so each year so the competition to mate is incredibly high. Of course every other stag wants to do the same, but there’s only so many females to go around. In order to maintain control over a group of females the stag must constantly drive away rivals. 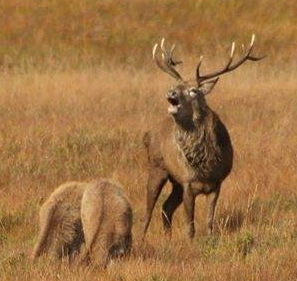 The stag announces his superiority over other males by constantly bellowing out an echoing roar which can be heard from over a mile away. On an island like Jura, with almost 7,000 deer, the rutting deer can’t be missed, both by vision and sound. Small groups of deer which usually consist of a stag and a couple of hinds, can be seen almost anywhere. The mating season starts late September and ends at the end of October which makes this one of the best periods to visit the island. One of my members was on Jura last week and sent me a lot of beautiful images of the landscape and the impressive stags and hinds. This event can also be witnessed on Scarba and Lunga, but not with the same numbers as on Jura where the Red Deer vastly outnumber the human population.